My FairyLoot box arrived over the weekend and I was looking forward to seeing what was inside it. I don’t get a FairyLoot box every month (because of the cost and I have the naïve belief that it’ll give me more unread books on my TBR but I do that myself to be honest) but I had to get this month’s box because the theme, Warriors & Legends, sounded fab. I think the box was really well put together and had a lot of cool stuff in it. There’s an exclusive blend of loose leaf green tea from The Tea Leaf Co – I don’t drink tea so no doubt I’ll be finding it a good home, but I do love the design on the container. I’ve become slightly addicted to candles lately so I love the box included one. There were two different candles you could’ve ended up with from In The Wick of Time, one called Flame and one called Mist. The Mist candle was in my box and I love the scent, it’s warm stone and woodsmoke and it’s a lovely subtle scent. The box also included an exclusive wooden Lord of the Rings bookmark from Ink and Wonder, a pair of Celtic patterned socks, a metallic feather pen from Flora’s Wonder Emporium and a chapter sampler of Naondel by Maria Turtschaninoff which sounds like a feminist fairy-tale. There were actually two books in this month’s box. The first is World Mythology in Bite-Sized Chunks by Mark Daniel, a cool introduction to different myths and legends from across the world. And the second was the main event – Flame in the Mist by Renée Ahdieh. I’ve heard so much about this book on social media over the past few months but never realised it was a Mulan-inspired story set in feudal Japan. Someone should’ve told me that and then it would’ve been right up my TBR! Flame in the Mist came with a signed bookplate, bookmark and a letter from the author and I do like how FairyLoot put the book in a little bag so it doesn’t get damaged on its journey in the post. I do like FairyLoot boxes. They always feature cool things that are to a high quality and stuff books that I wouldn’t normally get myself but nearly always enjoy. Next month’s theme is Elementalists and I think there’s still some boxes left if you’re quick. This month’s FairyLoot box arrived a last week and after seeing much excitement on Twitter about what was inside it I was looking forward to getting my hands on it. This was my second FairyLoot box, I got May’s box (and completely forgot to blog about it because it arrived just before I went on holiday) which I liked and I knew I had to sign up for August’s box as the theme was Dark Deeds and I love a villain. 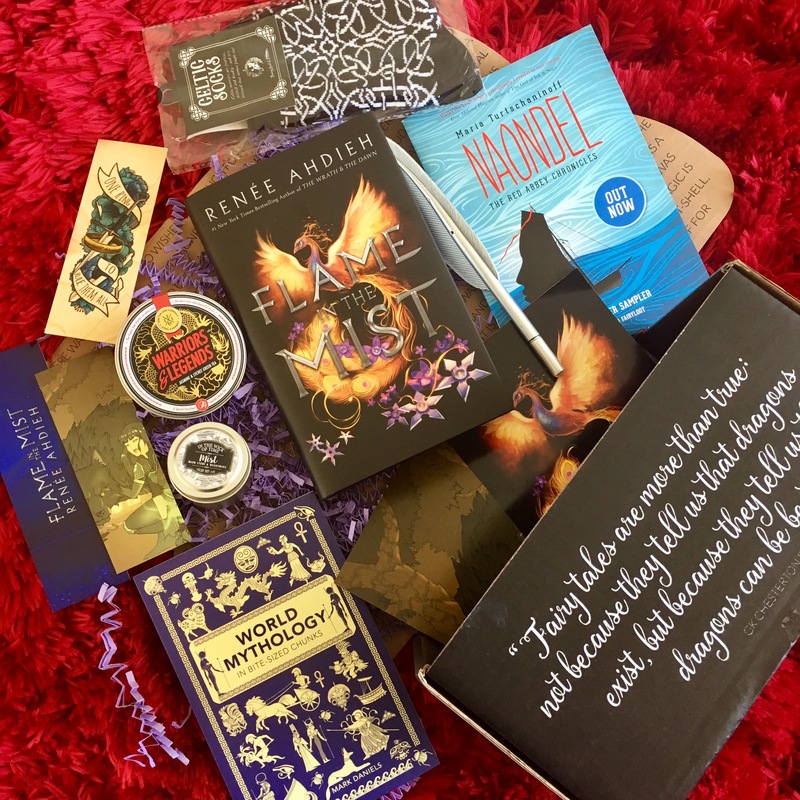 FairyLoot is a monthly YA subscription box based in the UK that tends to focus more on fantasy stories. You can find out more about the box here. 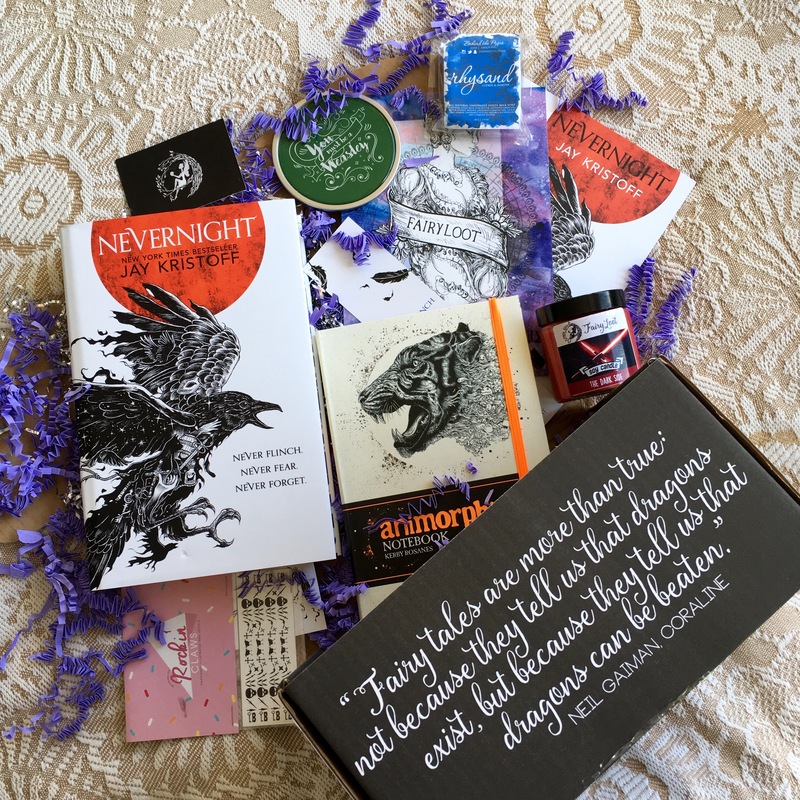 The book in this month’s FairyLoot box is Nevernight by Jay Kristoff and it came with a signed bookplate, an art poster, a bookmark and a letter from the author. Now you may have seen that that book has already come into my possession through my subscription to another YA box, Illumicrate. Yes, it’s a shame I got the same book but it’s understandable. 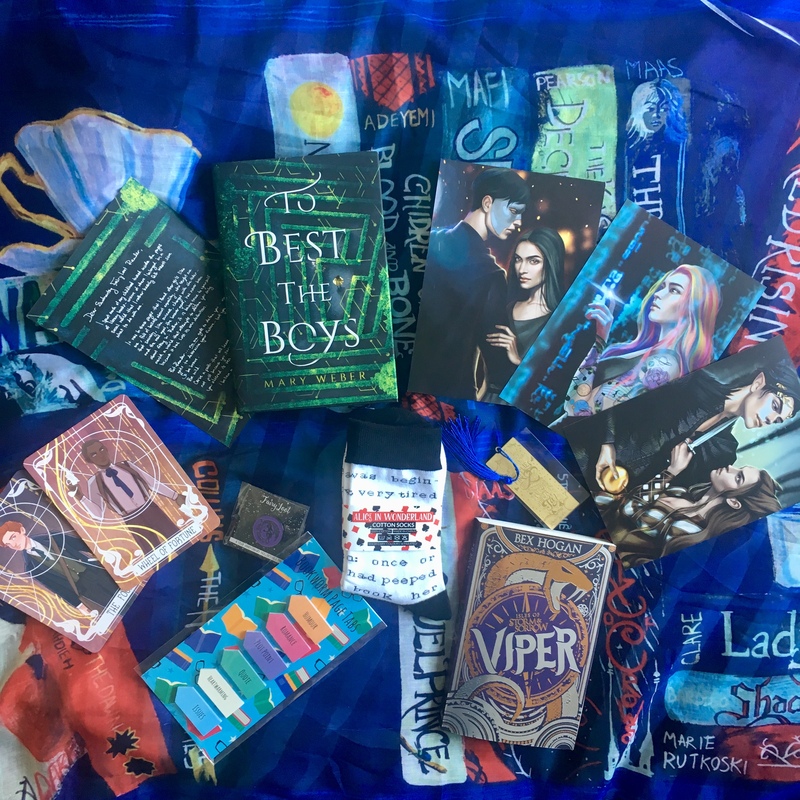 Each subscription box wants to have the newest and most anticipated release and if you’re subscribed to multiple boxes it is only a matter of time before you end up with the same book. I’m sure I’ll find a good home for my spare copy soon. The goodies that came with this box were great. There’s a candle that smells of The Dark Side – turns out The Dark Side smells like Fruit Loops (glad the card that came with the box told me that as I’m a Brit who’s never had Fruit Loops in her life) which is an interesting scent but I like it. There’s a cool Harry Potter coaster with a quote from Draco Malfoy by BookOtter and a bar of soap inspired by Rhysand from A Court of Thorns and Roses which smells lovely from Behind The Pages. There’s also some evil-inspired nail decals from House of Wonderland and then there’s the Animorphia notebook that I’m absolutely in love with. I’ve been thinking about getting an adult colouring book for so long but haven’t got around to yet so this is perfect, it’s a notebook but there’s beautiful animal illustrations you can colour! I honestly love it. It’s my favourite thing in the box and the fact I already have Nevernight doesn’t even bother me because this notebook more than makes up for it. 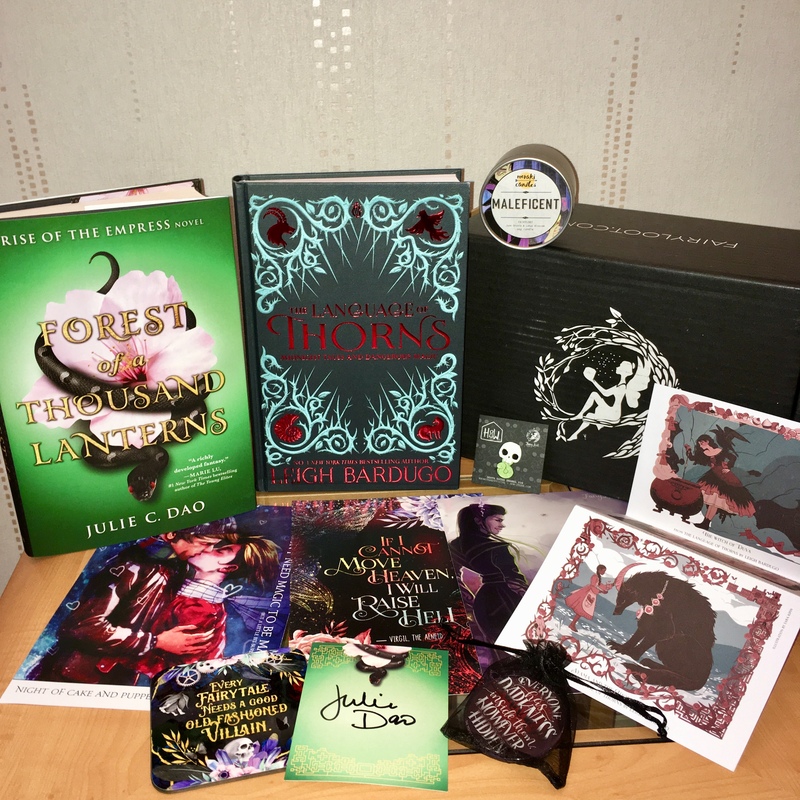 FairyLoot is a great box if you like fantasy books and related goodies and each month has a theme. It’s not too expensive but I know I just can’t keep on top of monthly subscription boxes so I’ll only get one if the theme takes my fancy.